It may just be the first full week of fall but visions of sugar plums are already dancing in my head. Nothing says holidays like celebrating with family around a glowing fireplace. An open concept floor plan or formal dining room are perfect for hosting those family get togethers and holiday celebrations. If, like me, your envisioning a new place to carry on family traditions, look no further than a John Houston Custom Home. But how can I have a new John Houston Custom Home in time for the holidays you may be saying!? Well friends I have the answer! Real estate is a hot topic these days in North Texas. If you aren't in the market to buy a new home, chances are that with the current state of the housing market, you have at least thought about buying a new home. If you are one of the many who has decided to buy, the next question is do you buy a new or used home? While there are definitely advantages to both, I have compiled a list for you as to why buying new is the way to go. Action movies always place “the good guy” in a tough spot, a dangerous squeeze, a life-or-death situation that puts the audience on their heels and gets everyone’s hearts racing. The quick decision and perfectly executed maneuvers of the lead characters ultimately create an outcome where all works out for the best in the end. About a year ago, we were the lead characters in our own little action movie. After our prior house had sold incredibly fast, we were in our tough spot. 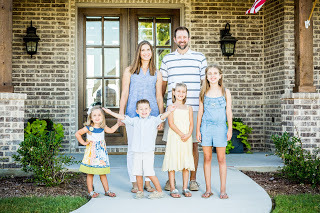 We were transitioning from the Houston area to Midlothian, had no place to call home, all of our belongings in storage, and four energetic kids out of school for the summer. Granted, it was not a dangerous, life-or-death scenario, but with our little rascals, one might characterize it as a real mayday moment (and some of our family and friends did). We prayed and prayed and asked the good Lord to provide us with the strength and patience to maintain our and our kid’s sanity and happiness. We also asked for some direction to put us where we are supposed to be.